Special Price $169.99 on sale until 4/30/2019! 60" x 60" x 86"
Covert Grow Tents (formerly High Rise Grow Tents) have arrived and are better than ever! Now with easy access viewing windows to quickly check on your plants without needing to open the door! Covert Plant Growing Tents are the solution to growing on a budget without compromising on quality. These well-built portable grow rooms are manufactured with quality components that are designed to stand the test of time! House your entire garden and all of its components in an easy-to-assemble, highly reflective grow tent. Control the mess and maintain a low profile without the need to build a grow room from scratch. 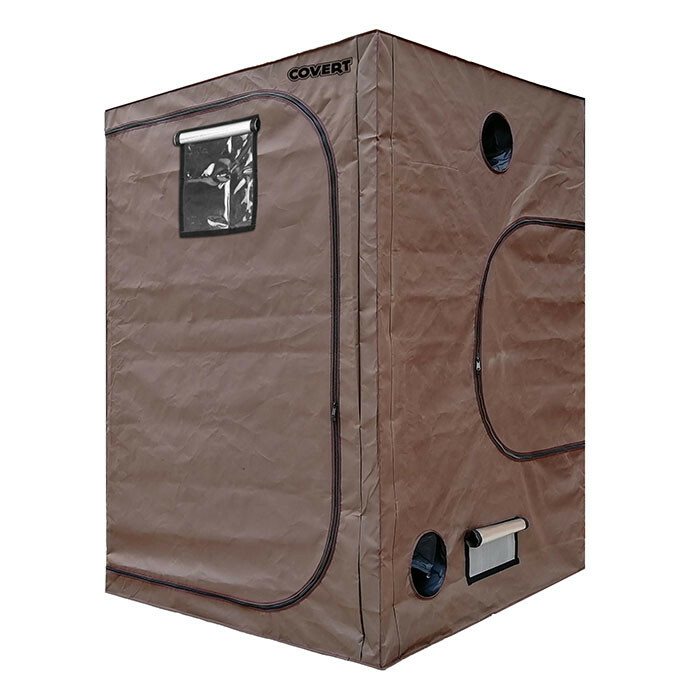 The 5' x 5' Covert Grow Tent is the most popular size; this tent will house 6-8 large plants from seed to flower with enough room for your plants to grow freely. The 5' x 5' space is a great fit for a 1000W HID light or an equivalent wattage LED, LEC or other lighting fixture. Set-Up Dimensions (LxWxH) - 59" x 59" x 84.5"
The solid metal frame has reinforced connections at the corners and will support well over 150 lbs. equipment like grow lights, carbon filters, fans and more! Sturdy 3/4" poles are powder coated for added durability and are easy to assemble with "bulletproof" corner connectors. 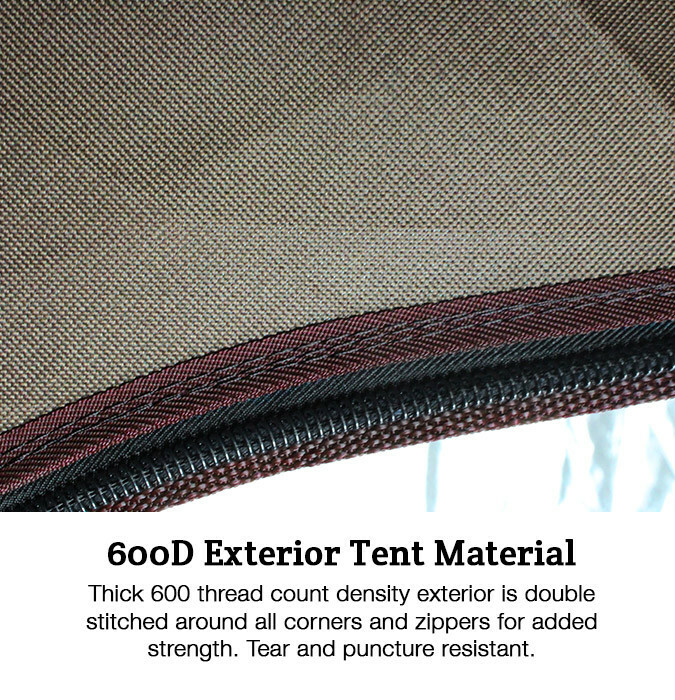 Thick 600D thread count density exterior is double stitched around all corners and zippers for added strength. 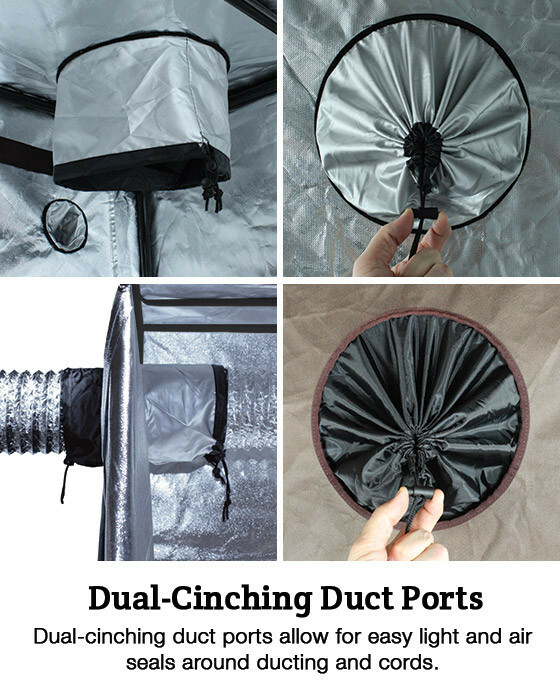 Durable all metal zipper made for repetitive use with light proof backing means no light leaks. 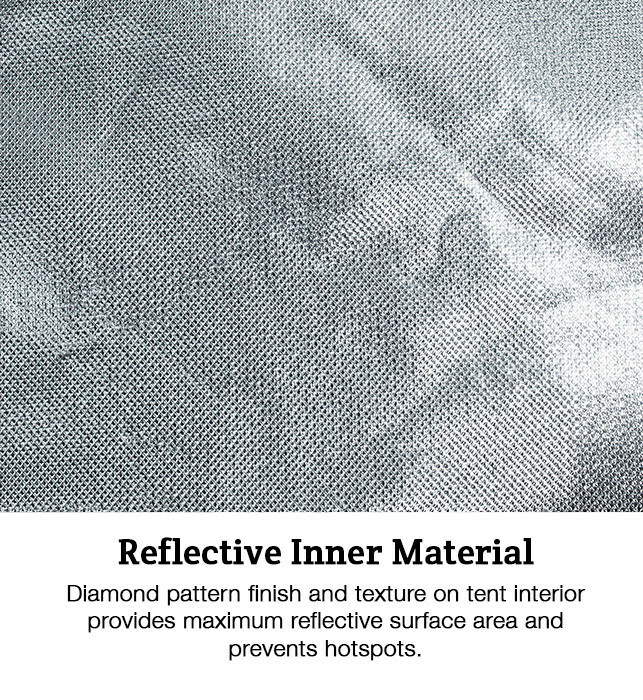 Diamond texture mylar interior increases reflective surface area and makes sure no precious light is wasted. The design of these grow tents was thought out carefully with the placement of the electrical cord ports as well as extra ducting ports for air-cooled reflectors and a ventilation system. The front door can be easily held back out of your way with the included door clip. 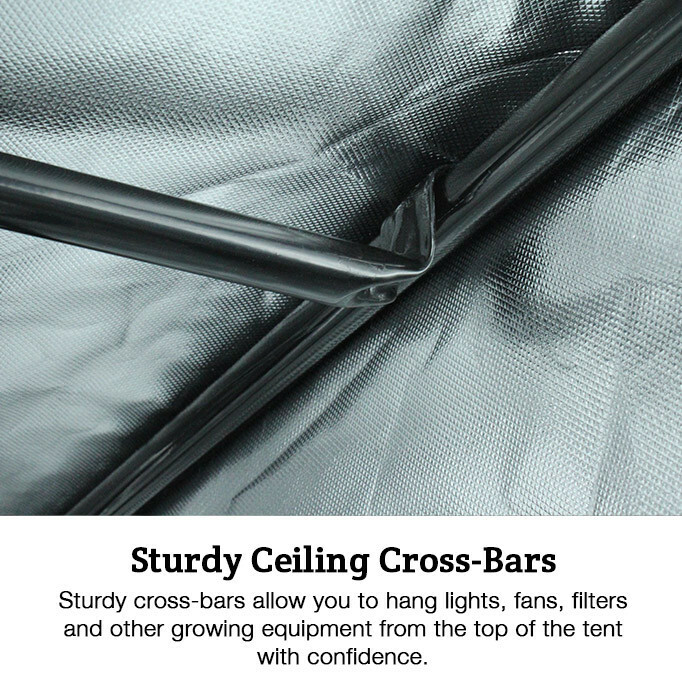 The mesh micro pre-filter vents located on the back of the tent allow for maximum airflow without letting any foreign pests or particles into the environment. Large front access door makes checking on your plants a breeze. The spill-proof tray can be removed and cleaned after each run for a sterile growing environment. Lined with the same reflective mylar interior that bounces back any light to the bottom of the canopy. 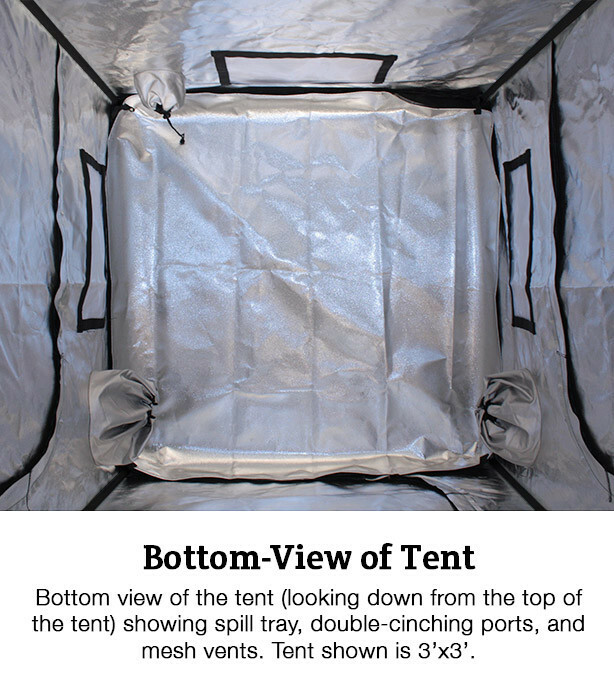 Includes a convenient tool pouch located inside the tent for storing your often used tools or nutrients. Covert Grow Tents are easily assembled with only one person, although a helping hand from a friend makes the job go quicker. The strong "bulletproof" corners connectors just slid and snap in place to create an extremely sturdy frame. 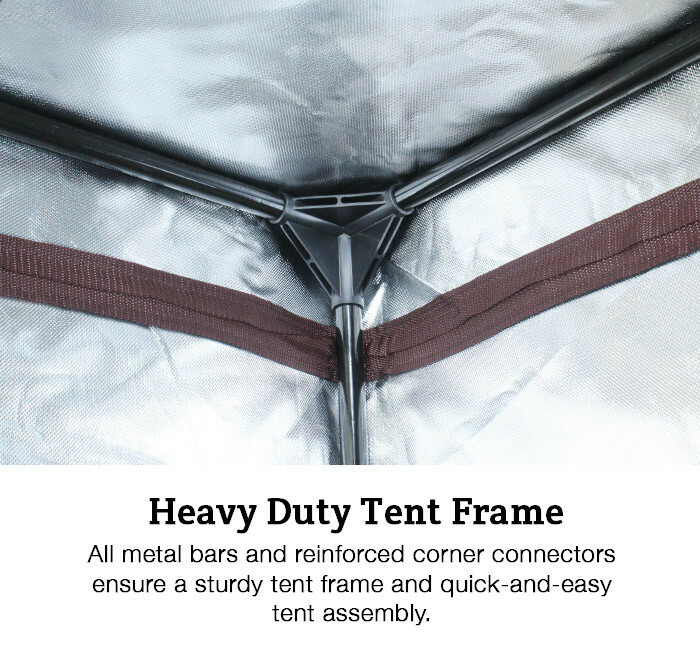 Tent fabric simply slips over the frame and is easily zipped onto the frame for a snug fit. 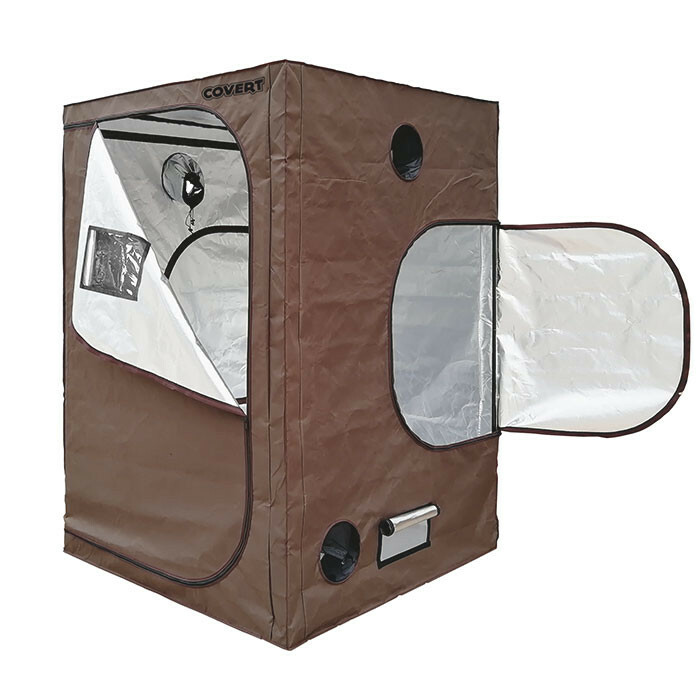 Not only are Covert Grow Tents an absolutely great value as a stand-alone grow tent, but they are also often used after harvesting your plants as an enclosed drying room. This allows you to manage your temperature and humidity levels better than in an open room and keeps your sticky plants free of any contaminants like pet hair, dust, and particles. If trimming your harvest when wet, consider hanging a drying rack from the ceiling of the tent for a more even drying process.